Incremental games test your patience. They also test how fast you are in tapping stuff and reward you accordingly. The most interesting part of such games is that you never become bored tapping or waiting for upgrades. Maybe because you get rewarded handsomely for your taps and swipes or maybe because we humans love seeing numbers going up and want more. TapnBuild is a simple yet addicting idle tapper game where players must collect resources to build and upgrade their castle. A player gets resources by simply tapping the mine, lake and the forest. To get picks, iron, gold, stone, he/she will have to tap the mine. Woods can be gathered by tapping trees and water can be drawn from the lake. One needs a certain amount of wood, picks/stones/iron, and water to build and upgrade your castle. For example: To build level 9 castle, you will need to collect 1.19K picks, 1.19K wood, 595 water and 40 stones. So there’s lot of tapping to do in order get a plenty of resources. (Tip: Use both thumbs to tap two different locations if you want to gather resources faster. So if you want wood and picks, then tap the mine and trees simultaneously to collect both resources). Tapping mine, forest and the lake for resources and watching your castle grow can be fun, but at some point of time, you may want to get more resources per tap, and finally collect resources automatically. To get more resources per tap, you should buy advanced tools such as axes. But if you want to collect resources even when you are not playing, start building contraptions, such as the small harvester (wood), auto-miner and water pump (to draw water). The fun starts when you build and upgrade these devices. The sequel to TapnBuild is also available on Google Play. It features multiplayer mode and has tower defense elements. Along with building a castle, you can protect it by constructing turrets. You can also recruit minions and deploy them to destroy enemy’s castle. You can also unlock and recruit workers. They will do all the hard work, gathering resources for you even when you are not playing. The multiplayer mode lets you compete against online players. You can create or join a private match or tap “Quick Game” to text your skills against a rival online player. Independent game developer Risto Prins is the creator of TapnBuild and its sequel. His story is an inspiration for aspiring game developers. Read his story (https://medium.com/indie-game-devlogs/how-i-became-a-game-developer-fcb5ad3c1954) to know how passionate he is about game development, what challenges he had to face and why he loves making games. If making money was as easy as tapping on lemons, we gamers would be millionaires. Sadly, AdVenture Capitalist is just a game, but quite a good one. There’s a layer of strategy underneath this idle clicking game. Besides tapping skills, this rags-to-riches game tests your management skills and how much risk you can take to earn profits. Occasional click-baits like upgrades, investors and managers can drain your hard-earned money, but can be immensely profitable if you know when to make the most of them. So what are you waiting for? Tap on lemons, oil companies, pizza shops or hire virtual managers to do it for you and earn cold hard virtual cash. So what if you couldn’t mine bitcoins on your low-end PC? There’s always Bitcoin Billionaire to give you a false sense of income superiority. You tap the screen rapidly to mine ‘virtual’ versions of this virtual currency, spend them on stuff you like and keep on tapping until you lose the urge to earn bitcoins. The stuff earned can then be spent of investments or property. Some can be saved for upgrading the mining machine. There are several ways to earn those fake bitcoins besides earning through the mining machine. Banner ads, video ads and free hyperbits that you can collect every day can be exchanged for the digital currency. Buying special upgrades will speed up mining. More upgrades, more coins, and more investments – the fun just keeps on repeating. Bitcoin Billionaire is addicting and a must-download game if you are a fan of this elusive digital currency. 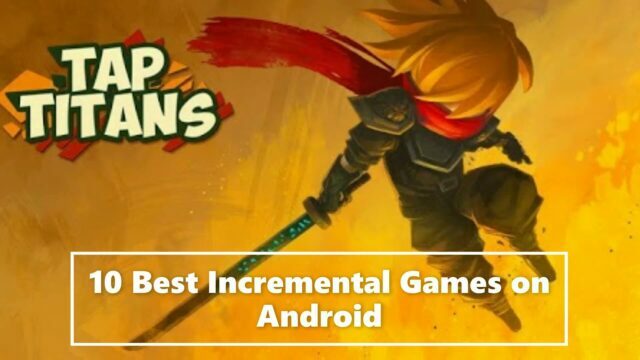 Tap Titans combines the clicker genre with RPG to provide an addicting gameplay experience. Serious RPG players stay away. This is one time-waster you would love to forget. There’s no exploration, tactics, in-depth leveling or weapon system - Just your hero and a random monster that does nothing except staring at your knight in shining armor. You will need to tap on a monster while your party inflicts passive damage to your enemy. A slain monster will drop gold, with which you can upgrade your hero and his team’s stats. A new and improved upgraded team will eliminate monsters faster. Not all monsters will keep on staring at you; some of them won’t tolerate your incessant clicking and will retaliate. But their feeble response to your attacks shouldn’t let your hero and his team down. Constant upgrades and your hero’s special abilities will do massive damage to monsters and powerful bosses. Tap Titans is one of those time-wasters you would love to play at your office or on your way to your grandpa’s place. You will fall in love with the graphics and cute monsters in this game. Aww look at those udderly cute cows mooing and pooping coins. These innocent looking mammals don’t know what’s in store for them. Soon they will be mutated into something weird and downright scary, and you will be in charge of turning them into grotesque creatures. The game combines the incremental genre with monster breeding. You will receive a box of adorable cash cows that can poop coins. And if they don’t, you will need to tap on them rapidly to get some more. Soon you will be creating “mootated” cattle by combining cash cows belonging to the same evolution level. The coins collected can be used to purchase high-evo cattle. The mutation procedure can result in something unimaginable – alpaca cows, bahamoots, uddras, betsies, alien cows whew! Brace for a cow invasion! There are several combinations and each result will be more shocking than the other. Cow Evolution’s udderly simple gameplay, adorable visuals and surprise breeds truly makes the game quite fun and addicting. Idle Oil Tycoon lets you build an oil empire from scratch. You earn money via gas royalties, oil royalties and oil fields. The money you receive can be invested in new technologies and specialists, which can boost your profits. These specialists include your personal investment advisor that choose the best property levels for you, the consultant that gives extra income from one of the purchased property and the efficiency manager that makes sure you receive profits regularly. Idle Oil Tycoon does not boast any fancy visuals. It’s very easy to play and has plenty of upgrades and achievements to keep you busy for hours. All you wannabe oil moguls out there, this game is for you. Gameplay-wise, MinuteQuest is better than the other two RPGs mentioned in this post. Here at least the boss monsters are tougher. Your hero will die many times, only to rise from the ashes and fight his way back to glory. You will need to level up your hero, make him stronger to defeat monsters. There are plenty of villains to be defeated, loot to be collected and treasures to be discovered. The game’s pixel-art visuals will take you back in time. MinuteQuest borrows the core RPG gameplay from popular games – hack and slash - and turns it into an enjoyable tap-fest. “It’s raining money, hallelujah, its raining money…” was exactly how I reacted when I began playing this incremental game on my Android phone. The premise is simple – you keep swiping notes off a stack to make money or “make it rain”. The faster you swipe the more cash you accumulate. Once you have made enough money, you hire people to keep the money flowin’ into your pocket. You can hire a lobbyist, a politician or a fund convention to do the work for you. Passive investments are fun, but there will be obstacles to your road to riches and you may have to take the illegal route or just rely on lady luck to get off authorities’ radar. Make It Rain: Love of Money is what a true time-wasting idle clicker game should be. It’s as insane as Cookie Clickers and extremely addicting. Do watch the hilarious promo video on Google Play before downloading this game. Tap Heroes’ adorable graphics reminds me of those pop-up fairy tale books. You open the book and up pops a knight in shining armor attacking a dragon or monster. The game takes you to a fairy tale land and lets you interact with characters and the environment much like a pop-up book. The game combines the beautiful world of pop-up books with role-playing elements. Your hero embarks on a dangerous journey, slashing monsters and defeating huge bosses. In each scene, you will help him achieve victory by tapping on monsters. One unique aspect about this game is the use of fingers. You can defeat monsters only when you tap on them with your right finger while the finger to the left can be used to heal your hero. There will be back-up heroes to help you. You will need to make your party stronger by hiring mages, rogues and other characters to your team, plus there are skills to unlock and upgrade. Leveling up heroes, unlocking and upgrading skills will make it easier for you to defeat monsters with less finger effort. Tap Heroes offers some depth in gameplay and is another amazing stripped-down RPG. Clicker Wars is an ideal idle monster clicker game. “Idle monster clicker” because all monsters stay idle while you take advantage of their indolent attitude to defeat them. You can tap, swipe left, right and center to get rid of ugly monsters. You can even hire heroes who will do half the damage for you. Your rapid taps and swipes will earn you coins, with which you can unlock new heroes, recruit them or upgrade them. Soon you won’t have to use your fingers as most heroes will do the damage for you. Clicker Wars has an assortment of lazy monsters to deal with. And each monster is scarier and uglier than the other. If you love idle clicker games, then don’t miss this fun time-waster.